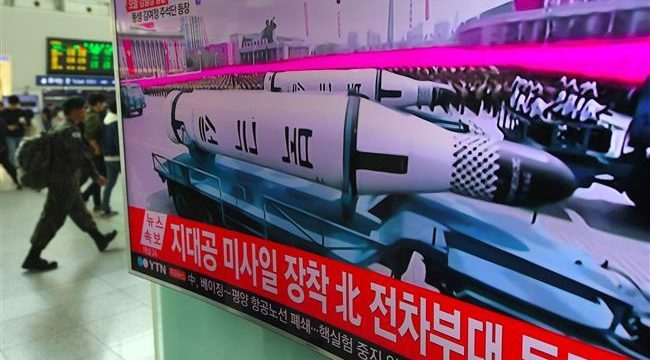 Press TV – Russia and the European Union (EU) have slapped tougher restrictions on North Korea as part of the international efforts to stop Pyongyang’s nuclear weapons program. On Monday, Russian President Vladimir Putin signed a decree for punitive measures against Pyongyang based on a UN Security Council Resolution adopted in December 2016. The almost 40-page document specifies certain punitive measures that were introduced in 2007, and refers to 11 North Korean individuals, who have been linked with the country’s nuclear program. The decree will affect cooperation in “nuclear science and technology, air-and-space machine engineering or state-of-the-art industrial technology and methods,” but still allows cooperation in cases unrelated to the country’s nuclear and ballistic missile activities. Putin has also ordered that sea vessels linked to the nuclear program be stripped of their Russian registration and banned from entering Russian ports, except in emergencies. The bans also cover delivery of new helicopters and ships to North Korea. Pyongyang has also been slapped with restrictions on “luxury” items, such as carpets and porcelain worth more than $500 and $100, respectively. Among other things, North Korea will not be able to use any property in Russia, except diplomatic and consulate facilities. The North sparked international outrage and tighter UN sanctions last month, when it carried out its sixth and most powerful nuclear test to date. The most recent UN sanctions, passed in August and September, effectively cut all trade with the country except for humanitarian deliveries and limited quantities of oil. Russia and China have supported UN sanctions against Pyongyang over its nuclear and missile programs, but warned that the restrictions should not affect ordinary people. Pyongyang has, however, condemned the global sanctions, saying the restrictions will not affect its military program, which it describes as a deterrent against foreign aggression. Also on Monday, the EU also adopted a new range of sanctions against Pyongyang. During a meeting in Luxembourg, EU foreign ministers signed off a new package of measures, including a ban on investments in North Korea and on EU exports of oil to Pyongyang. They also tightened the restrictions on North Korean workers in the EU to avoid the flow of money to North Korea, where it could be used to fund the disputed weapons programs. The bloc said the new steps were taken in view of the “persistent threat to international peace and stability” posed by the government of North Korean leader Kim Jong-un.